Anniversary shoots are a sweet reminder that you can capture the love of two people no matter where they are in their journey together. Jordan and Victoria are celebrating two years of wedded bliss, and the joy of their big day continues to unfold as they recently became parents to a baby boy. So, now is a most opportune time to commemorate their commitment. 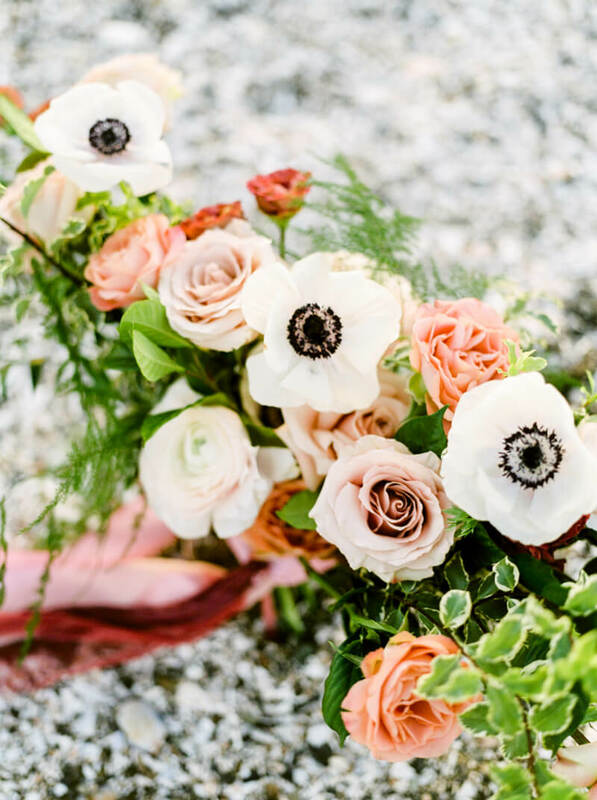 The style of this shoot is sweet and simple, with pink roses and black and white anemones as some of the chief design details. On a pebble-strewn shore, Victoria grasps her bouquet as the pink ribbons dance in the breeze. With the gentle sunlight dipping below the horizon, she looks angelic in a lace fit-and-flare gown. Jordan joins his wife on the shore and wraps his arms around her. He looks handsome in a black suit with a black tie and brown shoes. The photographer captures an up-close shot that shows the affection and love in their earnest faces. Facing the lens, Victoria’s stunning eyes are on full display as Jordan kisses her temple. The backlighting adds a warm glow as they nuzzle in together and show off Victoria’s wedding rings against Jordan’s arm. With the romantic bouquet by her side, Victoria grabs her husband’s hand as they pause for a few more photos amongst the tall grass. Just a few simple poses and a bouquet is all they need to create this romantic anniversary session. One last shot shows Victoria as a classic beauty in black-and-white, a keepsake to cherish and remind her that she will always be Jordan’s bride. Jordan and Victoria steal the show in their anniversary shoot, not because of what they’re wearing or where they are, but because of the emotion that shines from within. After two years together, they’re just as in love today as they ever were. And with a new baby and their whole lives ahead of them, this life they’ve built together is worth celebrating.